The stone has now been taken to Edinburgh whilst a permanent home for it is decided. It is described as being a class 1 unworked stone with carvings of symbols including a triple disc with cross bar, a mirror and a notched rectangle with two internal spirals. The new discovery is one of several impressive finds in the region. Another early Pictish stone uncovered nearby is now on display at the Church of St. Fergus in Dyce. Local authority archaeologist for Aberdeen and Aberdeenshire, Bruce Mann, said: “The exceptional summer has led to river levels being at their lowest for decades, so there was always a chance that something new would be found. “However, I certainly didn’t expect a find as stunning as this. Pictish symbol stones are among Scotland’s most distinctive monuments. Their elegant and vivid symbols and images can be found carved into boulders and slabs of rock, and on specially cut and shaped free-standing stones. Class I Pictish stones date to between the 6th and 8th Centuries AD, and are typically unworked stones with carved symbols. The meaning of the symbols is not clear but could represent the names of people. 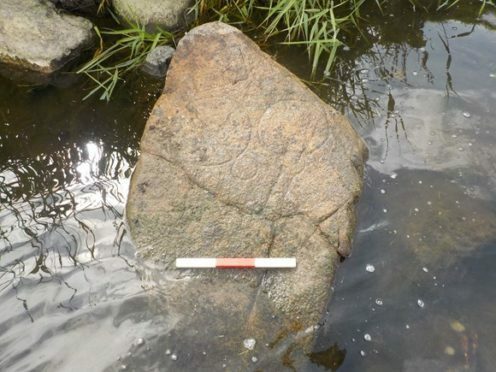 Gordon Noble, head of archaeology at Aberdeen University, who is currently leading a major research project into the early medieval Kingdoms of northern Scotland and Ireland, said: “The distinctive set of symbols carved into the stone meant we were quickly able to identify it as belonging to the Pictish tradition.